Dear ones, to watch or hear a lecture given by someone such as David Icke for instance, who exposes the intricate Agenda of the Elite, the Cabal, or Illuminati, is not something to run away from saying ‘it leads to fears’ implying it is bad in itself, for it is you who will, or not, experience fear from it, and if you do, you should fix it by calling to the Archangel Michael that I am, and asking me to cut you free from fears and doubts, or from whatever it is that can still trigger fears in you. If you ask to be cut free from all that is less than Christ consciousness, you will also be liberated from those dark nooks and crannies in your psyche that prevent you from being fearless. Trust in the Divine Plan, surrender your psychological self so it can be transformed by your magnetization of the Light, my blue flame, and the Violet flame, from the Great Central Sun, or from the heart of Saint Germain. There is nothing wrong with studying the world, what is going on in the political arena, nor studying the agenda and strategies of the forces of darkness, as well as the reasons why they are suppressing truth. You will gain a Perception of Reality and you know how to use the spiritual tools the Ascended Masters have provided in past decades. Once you know what is wrong you can make the calls to us, the Archangels, and ask for dispensations so these conditions may be resolved. A lot of what you know today through disclosure had already been identified by the Messenger Elizabeth Clare Prophet and she was protected in the Tube of Light when she studied the matter. In those days there was an additional threat in the fact of the existence of the Capitalist Communist Conspiracy and with the dissolution of the Soviet Union the communist threat is now irrelevant. However, although it’s true that the Cabal invents enemies with a view to create new conditions and implement their programs, the threat of terrorism is now something that did not exist in the days that the Ascended Masters communicated their instruction through her. There are many new conditions which you need to identify and then you will be able to mention them in your decrees to give us the authority to go into action and eradicate them. The interference of the dark ones cannot be removed in an instant. There still is a dark force clinging to power and although its time is up, a battle is going on as it should, as you know, and what you see of it in your physical world is like the top of the iceberg showing on the surface, and there is a great mass hiding below the surface of the waters, in the invisible world because it goes on beyond your spectrum of consciousness. Some notions were introduced a few years ago in the channeling circles of a group of lightbearers who were a new generation, so to speak, as they had not been introduced to the teachings that the Ascended Masters promulgated in previous decades through many groups. Many groups indeed received some teachings during the 20th century and it was said ‘Work while you have the Light’ because it was known that the Earth would enter a time of darkness in this period of the Kali Yuga before the proper start of the Aquarian Age. Progress was hindered. Some obstructions caused a development of situations in a way that had not been expected, up to recently in 2015. Not many people have questioned the saying that where there is Light, there also is darkness, nor its meaning. Not many have understood that it relates to the fact that the Dark Ones attack the souls of the Light in every Nation. So, yes, they are present where the Light appears and they attack those souls that achieve the most upon the spiritual Path of the Ascension. This emissary has experienced attacks, particularly during the year of 2014, but they provided an understanding of the mechanics and of the modus operandi that the dark ones use. This is a Latin expression meaning ‘ways of operation’. It was a useful training to be able to identify an impersonation of the masters. There is in the ability for telepathic communication a number of innate perceptions that can facilitate this identification. With the training came an understanding concerning the impostures carried out by the dark forces both from the astral plane and physical one where they have a scientific technology and secret weaponry system called psychotronics, that have been used to carry out a masquerade of telepathic communication or channeling, as well as to produce synthetic dreams that they insert in the minds of people to cause a disturbance. They have carried out an impersonation of the natural telepathy that is now appearing as an ability in the human kingdom as a result of its being irradiated with photonic light, and of certain DNA changes taking place. However, these impersonations of the Masters are of low quality as the dark ones do not understand the process of Ascension. You can easily catch them at their game as they demonstrate an absence of study of the teachings of the Ascended Masters. The Armageddon, or battle of the psyche, is not just the result of an opposition of the dark to those souls of Light. It relates to many transformations in the self, which may be of a spiritual or psychological nature. What is this Self I am referring to? It is the one that has taken control of itself in the physical world composed of four elements: fire, air, water and earth. We therefore refer to this Self of the persona as the ‘four lower bodies’ that you see represented as the bottom figure in the ‘Chart of your Divine Self’ showing your I Am Presence as the top figure. The ego forms a unit at the intellectual level with the emotional self of the water element. The part of this persona that corresponds to fire is the lower etheric part of self that leaves the body at night. There is a higher etheric self at the level of Christ consciousness where the records are being preserved. As has been said in the message ‘Ascension in the Past’ when you incarnated in the physical world with a reduced spectrum of consciousness, after the Atlantean cataclysms and the scrambling of the DNA of the forms you incarnated into, you left in heaven a celestial counterpart of yourself upon those realms of higher dimension because that higher etheric counterpart could not descend into the 3rd dimension. That higher counterpart exists beyond the level of Christ consciousness which represents the boundary above which there is no time, no change, and where, according to Scripture the Son is One with the Father. There is immortality in the Now and Place, or condition, or State of Being, of that Consciousness which is Cosmic, and Universal, but is also individualized as a celestial Christ Self. That Christ exists in the entire Spirit of the Great White Brotherhood, the Ascended Masters and Archangels, as well as the Galactic beings of higher dimensions. They help you to overcome the human consciousness which also is one of mortality. As you are being transformed and virtues replace what represents an antagonism to them, something within yourself has to give way and die a little every day. It is being replaced by something greater by the action of the Light and the transmuting effects of the Violet Fame. You must be willing to surrender all of these parts of yourself and ask me, Archangel Michael, to cut you free in this Armageddon of the psyche. An integration of the wonderful aspects of your Higher Self will take place but understand that, although you are asked to identify with your Higher Self, it is only when you are able to switch to the viewpoint of your Higher Self, or you have accomplished the full integration, that you should adopt your Higher Self’s name. A few years ago there occurred a dissemination of false notions in some channelings that were intended to eclipse the notion of the integration of the Christ consciousness. The interpretation concerning the resurrection from the human, or mortal, consciousness which is a key to understand the process of Ascension, was ignored or bypassed. But be not alarmed as you are living in the prophesied time of false teachings which is soon to come to a close as you are about to enter a time of Transition when these falsifications will be corrected. Teaching from your mentors will be telepathic on some cases and will also take place in the new Mystery Schools that will be formed. What you believe is not of an upmost importance if you have the right feelings and the right attitude. Truth will be restored but do not be afraid to look at, or hear, Disclosure about the ugly realities of your physical world. They will come to an end as part of the manifestation of the Divine Plan as you are in the end times when it is evil that will end, and all forms of corruption will be eradicated. Understand a battle is still taking place against the Establishment – that Babylon of ancient scripture – with its control of the media. The veils are falling and mankind is awakening as if it was a woman giving birth. That child is Christ consciousness. With the use of the 3rd eye the great masses of people are beginning to perceive reality for what it is despite the indoctrinations. There is another erroneous concept circulating in the teachings channeled to the Lightworkers because a detail has been misunderstood. It is in relation to the soul. It is not feminine as such and it probably was the symbolic comparison of the integration of Christ consciousness to a wedding that caused this misunderstanding. In this integration the soul’s solar garment of Ascension weaved by the angels is compared to a wedding dress. The soul doesn’t have a gender as does the physical form. The soul extension, or Self, however actually takes on a character that corresponds to its polarity in relation to its twin flame. These flames were created by the Higher Selves in the image, or polarities, of the Father-Mother God, so one has the image of the Father, and the other, of the Mother. The Archangels create extensions of themselves in embodiment corresponding to their polarity or character, and upon the higher octaves of being they don’t need to switch over to the opposite polarity as was claimed of Archangel Gabriel. Another erroneous notion is the one that suggested that souls can go as they please after death, for instance go and experience life upon another world. Souls have been bound to Earth because they could not escape the Wheel of Incarnation and that was because they did not manage to balance karma. Their liberation could occur after death by achieving the Ascension as it is possible to further advance upon the Path by attending classrooms in the Mystery Schools upon the Etheric plane. It is actually easier to resurrect from the human consciousness when out of the body. Many of you have acquired the perspective of the 5th dimension and are firmly anchored upon it by your level of Spirituality. Do not be concerned that it will be affected by such studies alleged to lower vibrations. You have to acquire knowledge and information is light. These studies do not affect your spirituality. If you have an illness, do not be concerned as the pain as well as your thoughts and worries about your condition will not affect the level of spirituality which anchors you upon the 5th dimension. Raise your thoughts to your I Am Presence if you are able to, and let them dwell upon us, the Masters, Cosmic or Galactic beings and Archangels, who love you, come to heal you, and are with you always. 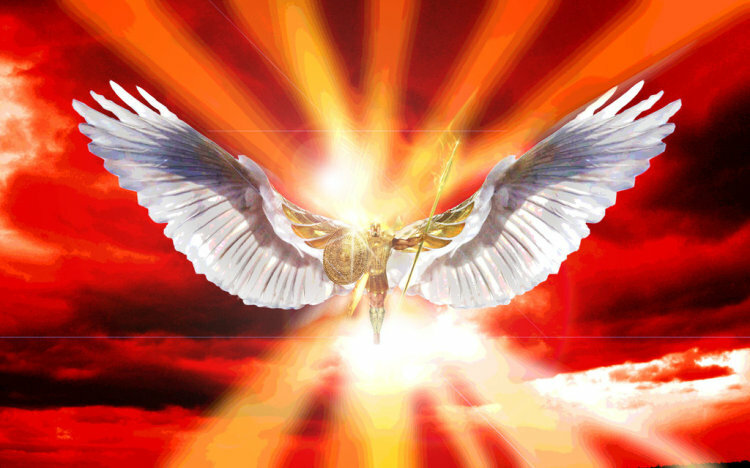 I am Archangel Michael, Prince of Peace and of the Mystical Body of God upon Earth that represents the real Church.